The public mass transport system has been in turmoil for over a month. Government and unions are arguing about salaries, working conditions, contracts etc while commuters are watching helpless and struggling to get to their destination any way possible. Tomorrow Monday the Metro and the railways are on a 24 hour strike while the busses will stop operating from 11 to 16 hours. At the same time their unions will hold general assemblies to decide on how they will continue their struggle. In the meantime the government has already announced an increase in the bus fare – from 1 Euro for a 1and a half hour ticket to 1.20. The monthly card for buses has gone up from 15 to 20 Euros. I went to the theatre the other day. On the way home it hit me : the outing was a good reflection of the present situation in Greece. Getting to the theater, situated in a once fashionable now seedy part of Athens, right next to the infamous Victoria Square and two streets away from the notorious Filis street, filled with squalid brothels, was an adventure on its own since we had to drive between an anti – racist protest and the extreme right wing supporters who had gathered to protest against the protest! The play, an old comedy of manners, was called “Fiakas” – meaning the “show off” . It was written and performed in Istanbul in the middle of the 19th century and relates the story of a charming scoundrel, living as a parasite in an opulent fashion and his efforts and failure to woo and marry a rich, naive heiress. A comedy of characters it satirises subtly the tendency to copy the western way of life – the rogue’s impersonation of a German baron is the argument that convinces the young girl to accept his proposal!! The very good performances were punctuated by Smyrneika – songs of the Constantinople and Asia Minor Greeks- still very popular with the Greek public. There is fear in the air in Greece, fear of the looming economic crisis, fear of the immigrants’influx, fear of unemployment, fear for the future and I had a taste of it while getting to the theater. At the same time, Greek society is keeping up appearances and showing off but our crimes are really misdemeanours – we are all looking for a rich, naive heiress. The nostalgia of the Polites – the Greeks born and bred in Constantinople – is also apparent and it still exists in modern Greece. No wonder Turkish tv serials are extremely popular, mostly for their beautiful portrayal of Istanbul, the Poli, the absolute city for the Greeks. Theatre is a mirror of life in more ways than one. Apostolos Gletsos, tv heartbeat ten years ago, communist party candidate for mayor in his native town Stylida ( center of Greece) more than once, was elected as an independent at the recent elections. He made headlines last week for opening up the tolls outside Stylis with the municipality’s graders. 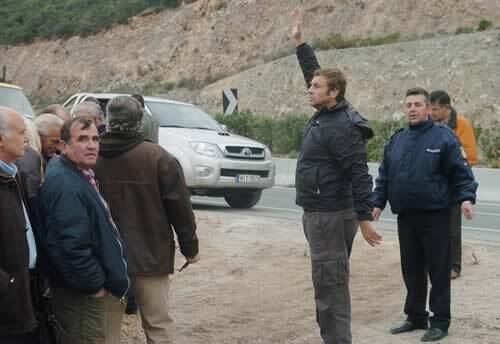 His explanation was that the company constructing the highway and also collecting the tolls had erected metal bars in the side streets outside the town of Stylis to prevent drivers from avoiding the tolls but at the same time cutting off local farmers from their livelihood. According to the citizens of Stylis they often had to pay twice a day to go to their fields! The mayor’s actions were supported by his voters but also by the opposition in the municipality while the nation wide committee against tolls issued a statement justifying his actions. He has been released but is not yet clear whether he will be prosecuted or not. support- our hope for the future?